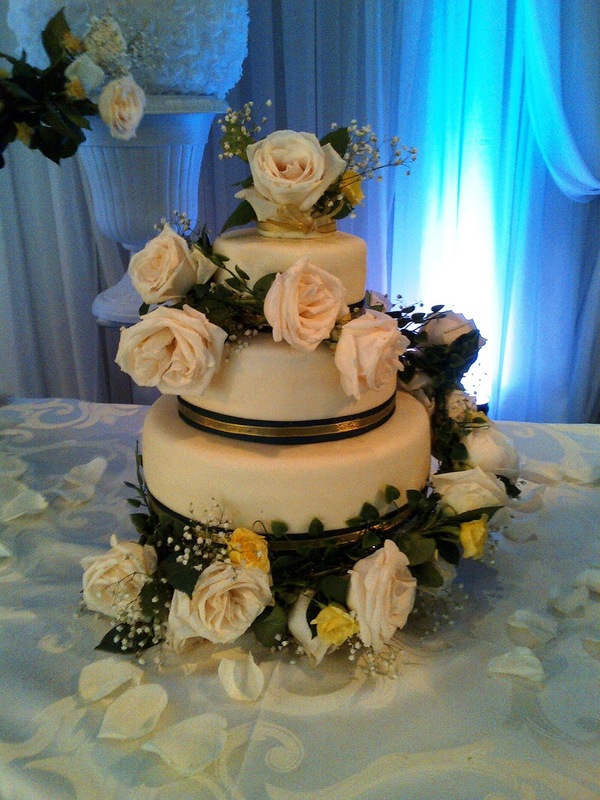 Here are some photos of a wedding cake commission I did for a new client a few weeks ago. The bride to be wanted a very simple cake; three Madagascar vanilla tiers to serve 100 guests, with vanilla Swiss buttercream filling and fresh summer berries in each layer, covered with ivory fondant, and wrapped with a mallard green and gold ribbon (the bride’s colours) on each layer. And she wanted roses. Lots of big, beautiful, creamy white roses. 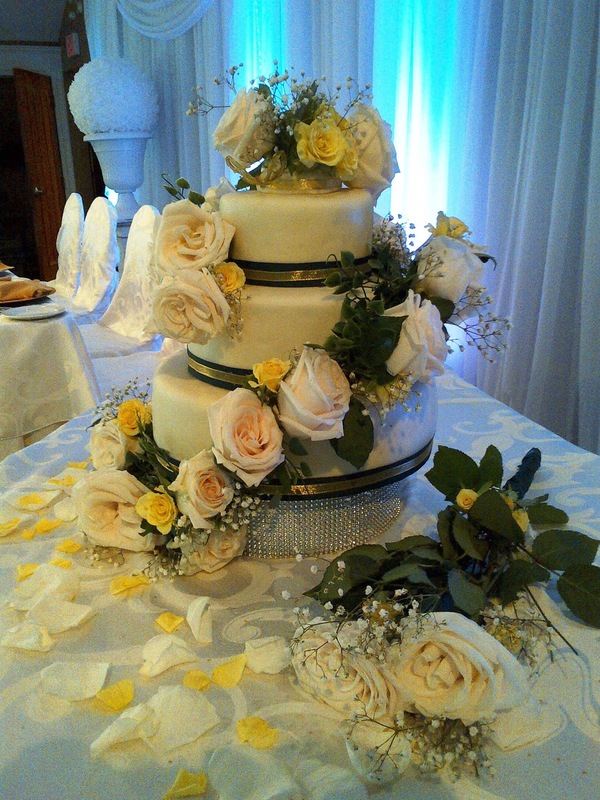 I recommended a few other flowers to balance the colours a bit; namely yellow mini roses, some baby’s breath, and green ivy. 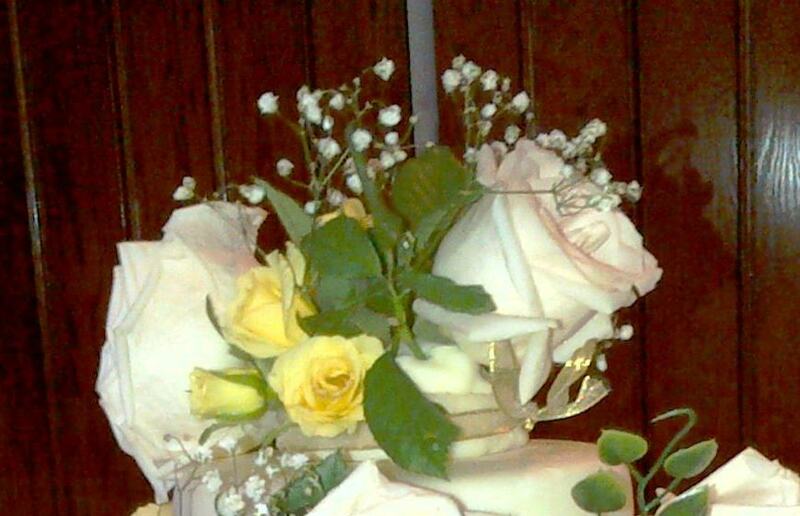 I then made a wire wrapped flower bouquet strand about 4 feet long, and secured it around the cake in a spiral when we set up the cake at the reception site. Lastly, I made a quick cake topper from some of the leftover flowers, just in case the bride and groom didn’t have anything for the top of the cake (they didn’t). 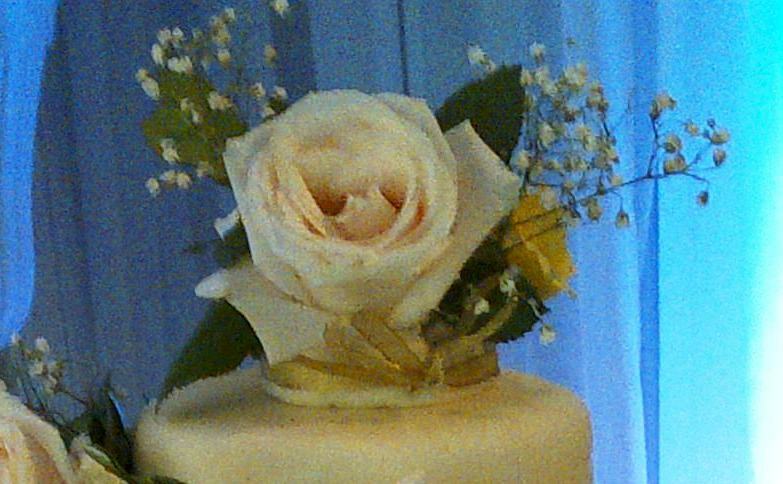 This was one of the first times I’ve worked with fresh flowers for a cake, and there are definitely challenges to keeping the blooms perky long enough to both wire them and display them on the cake. I personally prefer gumpaste flowers; they last for a long time, they can be made well in advance of the cake’s delivery date (they need lots of time to dry properly), you can create “fantasy flowers” in literally any shape and colour you can imagine regardless of season or availability, and, stored and handled properly, they keep their shape and colour for a long time. On the minus side, they are far more expensive than fresh blooms because they’re much more difficult to create than to just buy fresh, and it’s a specialized skill that not all cake decorators have in abundance. All in all, I’m pleased with how the cake turned out from inspiration to execution, and though I would do some things differently next time, I believe the clients were pleased with their cake too!